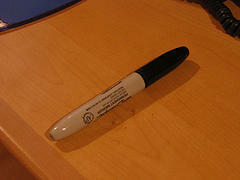 Below I've collected tips for how to remove permanent marker from wood surfaces. When you are dealing with wood you need to be careful, because you need to keep from marring the surface with the techniques you use. Unfortunately, as their name implies, "permanent markers" are meant to be, well, permanent. Therefore, what removes these marks can also cause harm to your wood surfaces, or at the very least may remove the protective polyurethane coating which covers many types of wood objects these days. If your wood piece is very valuable, you may want to have a professional work on it, instead of taking the do it yourself approach. However, even if if you're willing to give it a go yourself, always test the method you are using first in an inconspicuous area, to make sure it does not harm your surface, before attacking the actual stained area. Like I said, I've gathered some tips below, but there is almost always more than one way to clean or remove stains from something, and figuring out how to remove permanent marker from wood is not exception. If you've got your own tips for this I would love to hear them, and include them on this page. You can share your tips for removing permanent marker stains here, or read even more tips already submitted for all types of surfaces. 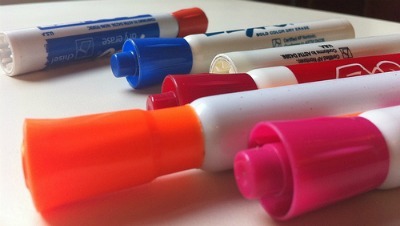 Over at the blog Premeditated Leftovers Alea gave a surprising tip for permanent marker removal -- using a pink eraser. Permanent marker had leaked onto her wood table and she was afraid she would never get them out. Someone suggested she try erasing the permanent marker stain with a pink eraser, and so she tried. I would love to hear from you in the comments to tell me whether this has worked for anyone else, or not. I am quite curious, because this seems almost like it is too good to be true! In addition, you can share your tips for removing wood stain and grime from furniture here, for either permanent marker or any other stain or mess. Dee has shared this tip for how she removes these stains from furniture. Have a permanent marker stain on your furniture? Use a DRY ERASE marker! It really works! Simply color over the stain with the Dry Erase marker, and wipe away! That's all there is to it. I've found that EXPO brand dry erase markers work best. Thanks Dee for sharing your tip. I've included the tip here with all the others for removing these stains from wood, since I'm assuming you are referring to doing this with wood. Please note that I've never personally tried this method, so as always with any stain removal technique I suggest first trying this is an inconspicuous area of your furniture to make sure it works first, before you do it anywhere else. I had heard, though, of using dry erase markers to remove these stains from a white board so it wouldn't completely surprise me if this works, especially for wood which has a polyurethane coating on it. I'd love to hear from others if they ever use this method to report how it worked for you, good or bad. You can share your own experience here. 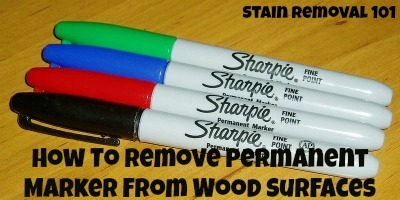 Have you ever heard that you can remove sharpie or other permanent marker marks from wood with hairspray? Well, to a certain extent this works. The reason that hairspray works on permanent marker stains is because most hair sprays contain alcohol within them. Of course, hair spray also contains glues and other chemicals which can cause the surface to afterward feel sticky and attract dirt. Therefore, I caution you to use hairspray for stain removal of any kind with caution. You can learn more about my thoughts about hairspray uses for stain removal and cleaning here, as well as see more ways to use this product around your home. If you're interested in trying this method in your quest for how to remove permanent marker from wood, I would suggest as an alternative to hairspray to use rubbing alcohol instead, since it doesn't contain all the glues that can cause problems when using hairspray. In addition, you need to be careful with anything wood not to hurt the finish or allow any type of liquid to sit on the wood's surface for too long. Finally, you should first test the alcohol (or hairspray) on an inconspicuous area of the wood, before using it on the marks, to make sure it does not damage or mar the surface of the wood. It is true, thank you so much, it really helped me from getting in trouble. I used the pink eraser on a cherry wood table. My legally blind friend was making a point by drawing circles on the table and thought she had the pen closed. Read your post and got the marks off. I will need to touch up with a little polyurethane! Thank you. I recently purchased a piece of furniture from an auction. It has a large 6" X on each door. How can I remove this? All I can say is it works -- common rubbing alcohol, with a paper towel, takes it off. I went back with some Pledge and cleaned, looks good as new. Thanks for the tip. Years ago my son decided to take a Sharpie to my beautiful walnut dresser. Luckily it had scattered black specks in the finish. I used nail polish remover, applying it ever so lightly, and it worked. Thankfully he never did that one again. Rubbing alcohol will take Sharpie marker off hardwood floors. Mr. Clean Magic Eraser took sharpie off our wood dining table beautifully without harming the finish. Toothpaste got the Sharpie marker off my oak coffee table! Well, toothpaste and elbow grease!